Zander Gates is announced as Aggie Idol. 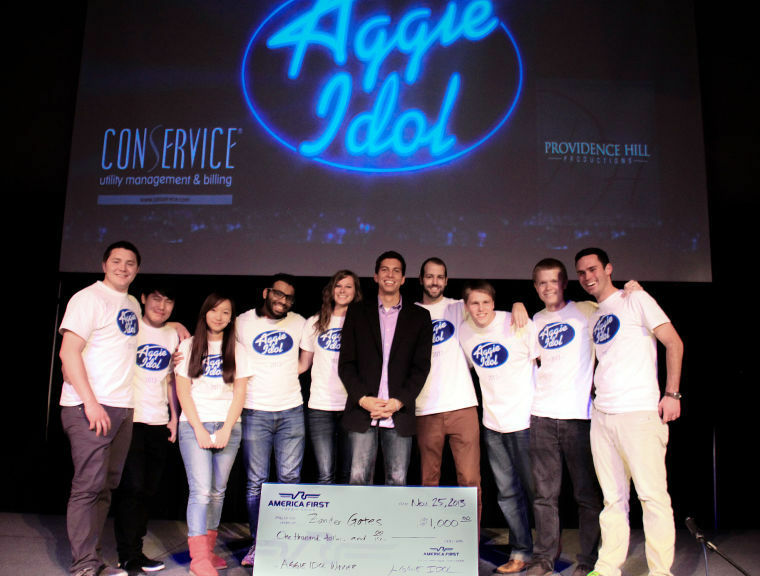 LOGAN – The first-ever Aggie Idol started out as a project for a business management class, but it quickly turned into something bigger. A group of nine Utah State University students dedicated the past two months to organizing and advertising for the event. They hoped that 500 to 600 people would attend. 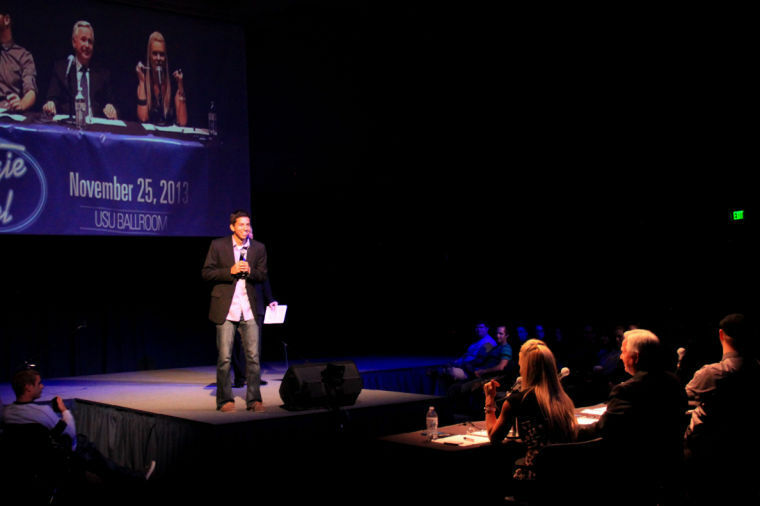 Turns out, almost 1,200 came out and filled the TSC Ballroom to listen to the eight finalists perform. Besides finding talented singers around campus, the group also put together a prestigious panel of judges. Craig Jessop, Jenny Jordan Frogley and James Case were judges for the show. Jessop conducted the Mormon Tabernacle Choir and currently is the Dean of the Caine College of the Arts at USU. Frogley is a pop singer and has performed all across Europe and the United States. She also performed at the 2002 Winter Olympics in Salt Lake City. Case sings as the bass for award-winning acapella group Eclipse. Dan Clark also served as guest MC. Clark is a professional motivational speaker, author, and CEO of Clark Success Systems. Hunter Kofford, Cade Mower, Ricky Aliifua, Marc Cabanilla, Tyla Rae Bearss, Ally Roundy, Zander Gates, and Nate Heaps were the top eight contestants. These eight performers were chosen from an original 95 auditions. After all eight of the talented singers took the stage last night, the crowd and panel of three judges voted on the top three. Tyla, Zander and Nate made the top three, giving them the opportunity to perform one last time for the title of Aggie Idol. All three performers chose Michael Buble songs for the final round. Tyla gave a bluesy and powerful performance of “Feeling Good” while rocking the stage with her pregnant belly. She and her husband are expecting their first child. Zander spread the holiday spirit by singing “Christmas (Baby Please Come Home)”. Then Nate stood in the spotlight and charmed the audience with a rendition of “Everything”. The three finalists were each awarded studio time with Kyle Wesley. The judges praised Zander for his smooth voice and Case even said that when he closed his eyes and listened, he could swear he was listening to Michael Buble. As for the group organizers, Nielsen said they far surpassed the class requirements with Aggie Idol and that he is happy with how everything turned out. “It was really time-consuming, but it was also really fun. It was fun to treat a class project as something bigger than just a project,” he said. In fact, they had so much fun that the group is already talking about putting on a second Aggie Idol next year. Zander stands before the judges. The judges take a moment to collaborate. Winner Zander Gates poses with the group that organized this year's Aggie Idol.